Eco-Evo Evo-Eco: What are eco-evolutionary dynamics? Evolution is obviously driven by ecological differences: think of the adaptive radiation of Darwin’s finches. Just as obviously, ecological processes are influenced by evolution: ecosystems depend on the oxygen produced following the evolution of photosynthesis. Less obvious is how these interactions play out on the short time scales most relevant to conservation and management. Do ecological changes (e.g., invasive species, climate change) drive appreciably evolutionary change over years or decades (i.e., “contemporary evolution”)? Does any such evolution influence ecological variables (population dynamics, community composition, ecosystem function) on similar time scale? 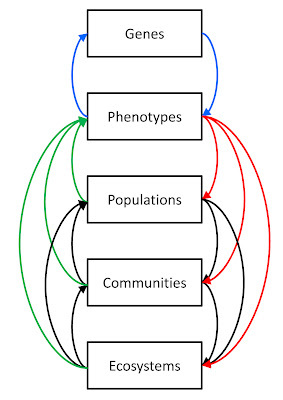 These potential interactions between ecology and evolution, as shown in the figure, represent the growing field of eco-evolutionary dynamics. Many studies have shown that ecological changes cause phenotypic changes in natural populations (eco-to-evo). Examples include species introduced to new environments, native species responding to introduced species, populations exposed to harvesting or pollution, and populations facing climate change. Existing work has shown that the phenotypic changes can be substantial, particularly when humans are involved. What isn’t known generally is just how much of this phenotypic change is the result of evolutionary change versus phenotypic plasticity. Even less is known about how these contemporary phenotypic changes then influence ecological variables on similar time frames (evo-to-eco) – but some nice examples can be provided. Populations: Phenotypic changes from one year to the next clearly influence population size in ungulates. The genetic contribution to this phenotypic change is not known, whereas a study of butterflies has documented effects of genetic change on population sizes. What remains to be determined is just how common these effects are, and how important they are relative to traditional “ecological” effects (e.g., rainfall or temperature). In addition, it isn’t clear under which conditions these population dynamical effects of evolution can actually save natural populations from extinction (i.e., evolutionary rescue). Communities: Genetic and phenotypic differences between individual plants have been shown to have noteworthy effects on arthropod communities. Similarly, genetically-based phenotypic differences between fish populations have strong influences on aquatic macro-invertebrate communities. What remains to be determined is, again, how common these effects are and, also, how year-to-year changes in these genes and traits (as opposed to the currently-studied static differences) influence those communities. Ecosystems: In the same plants and fish studied for community effects (above), genetic and phenotypic differences have been shown to influence ecosystem variables such as decomposition rates, dissolved organic material, light attenuation, and primary productivity. Since the study systems are the same as above, what remains to be discovered is also the same. It will also be interesting to know how often these ecosystem effects of evolution fall into the category of “ecosystem services” that have become so integral to conservation efforts. The above listing highlights a few specific examples of how evolutionary change might influence ecological variables on short time scales. In addition to the specific uncertainties listed above, some additional general ones come to mind. How often do evolutionary effects on communities and ecosystems flow through the effects of evolution on population dynamics (indirect effects – red to black arrows in the figure) versus changes in the traits themselves (direct effects – red arrows only)? Do the effects of evolutionary change on ecological processes decrease from population to community to ecosystem variables? How often do true feedbacks occur – that is an ecological process drives evolution (green arrows) that then alters that same ecological process (red arrows) and so on? Eco-evolutionary dynamics is an area ripe for future work. Could zoothanthelle be an ancestor or relative of the cells that make up coral? I am thinking that if choanoflagellates may be a predecessor of choanocytes in sponges, can zoothanthelle be a predecessor of coral cells? However sponges do not have tissues. Corals are made of tissues. Maybe zoothanthelle was a predecessor of something before the current coral body form? Can mutualistic or symbiotic relationships be an indicator of evolutionary ancestry? If they are linked, maybe there was some reason for the divergence of the dinoflagellate cells from the coral cells? What caused them to form an ecological relationship versus a biological one? There is a proposed biological relationship between a sponges choanocytes and the choanoflagellates..protists. However there doesnt seem to be an ecological one...mutualistic or symbiotic. What forces cause an organisms to shift their body plan from an ecological one to a biological one? Or vice versa? Is it chemical signaling, genetic, what? I am also wondering if an organisms ecology and biology are on some kind of continuum? If so, what causes shifts in the continuum? I sense that there is some math involved here and some kind of model????? What do you think about the field eco evo devo?